About MushikamayaObama Hot Spring with the highest amount of heat in Japan. 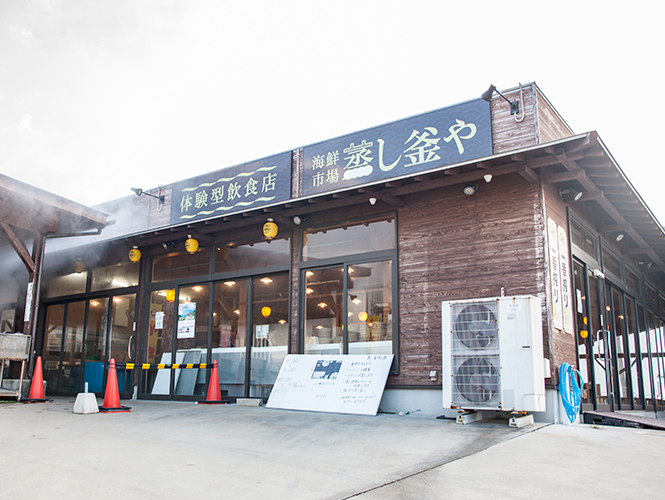 This is a store where one is able to enjoy homegrown steamed riches of the sea and the soil at the best hot spring. We look forward to welcoming everyone. MenuWe offer various menus such as rice bowls, set meals, plans, steaming experience and so on. 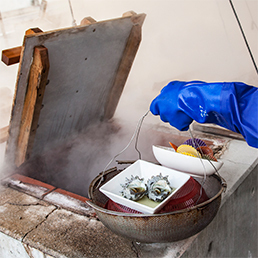 “Jige Don” – seafood rice bowls such as locally harvested fish and shellfish rice bowls, “Yoso Don”- rice bowls of fish such as salmon and tuna that are not locally harvestable, “Yokubari Don” – well-dressed rice bowls of ingredients all mixed, are popular. 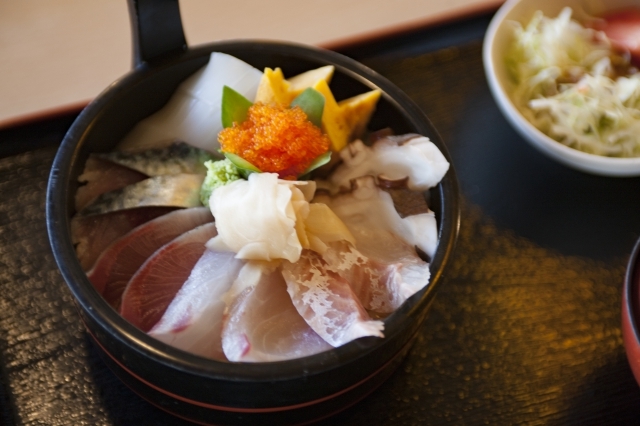 In addition, we also offer rice bowls catered to children, Chirashi-style mixed seafood bowl and salmon rice bowl. 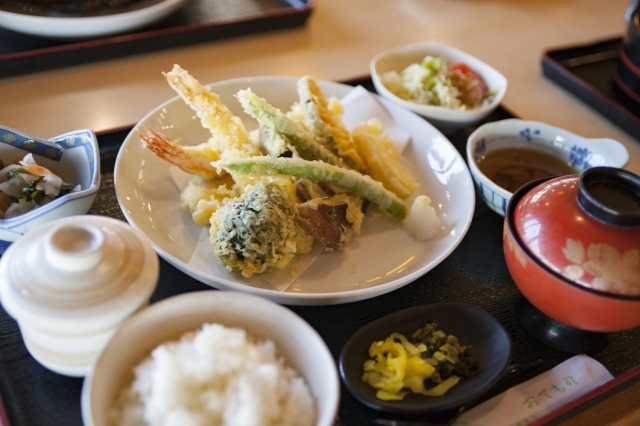 Set meals based on fish such as sashimi set meal, boiled bones of fish set meal, and filling tempura set meals, fried chicken set meals are available. 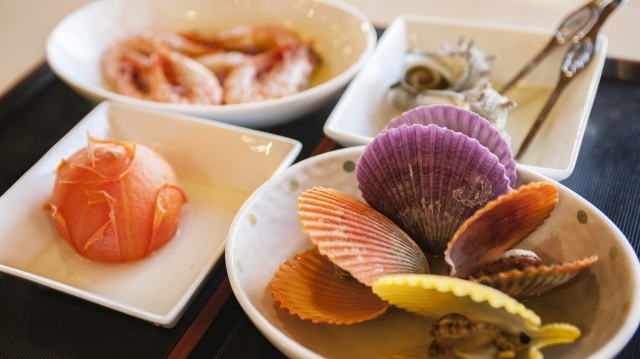 Depending on one’s budget, set menus such as fish dishes and steamed dishes are also available. 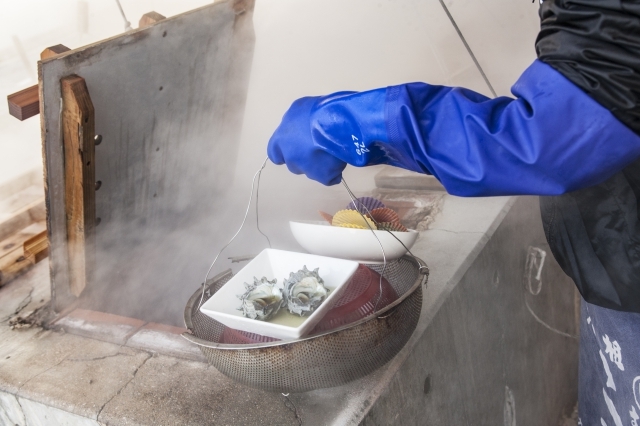 One can enjoy steamed dishes to one’s liking, steamed with the steam of the high temperature source of Obama hot spring. One can choose light refreshment sets, chickens, pigs, vegetable sets, shellfishes and fish from the fish pond and fresh vegetables as one likes. Obama Hot Spring with the highest amount of heat in Japan.This is a store where one is able to enjoy homegrown steamed riches of the sea and the soil at the best hot spring. 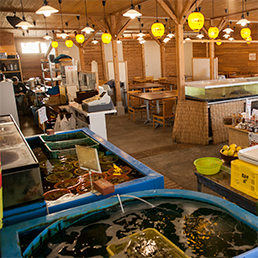 Seafood Market Mushikamaya awaits everyone's visit with freshly harvested and prepared fish and vegetables daily. 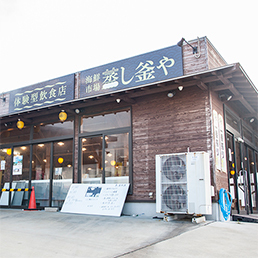 Copyright (C) 【海鮮市場　蒸し釜や】は雲仙市小浜町の体験型飲食店です All Rights Reserved.